Despite some rain on Saturday night, the first weekend of the demolition of the Grand Bridge and Grand MetroLink Station elevator towers resulted in plenty of destruction. 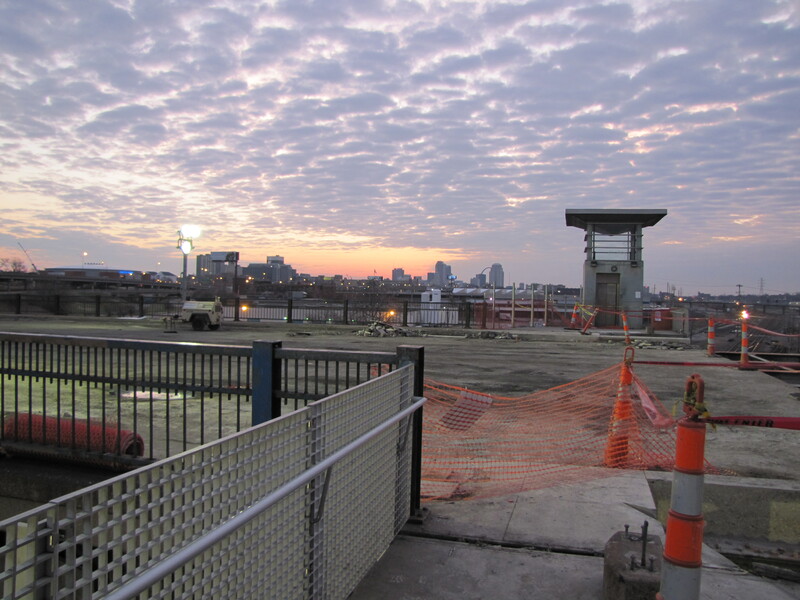 Both elevator towers are gone, and much of the Grand Avenue road deck on the bridge has been removed. Crews worked around the clock this past weekend given their short window, while MetroBus shuttles moved passengers between Central West End and Civic Center MetroLink Stations. See the below slideshow for all the weekend’s action. Click here if you cannot see the slideshow. Contractor is working on the temporary turn-around this week, it will eventually become a new parking lot. For now, it will be used to turn buses around when the station reopens. This includes putting in utilities for lighting in that area. Holes from the elevator towers will be covered before the station reopens. West end of the platform is being torn up to build the new (permanent) access point from the platform to the new transit plaza. Because this is taking up some of the space we need to operate, we’re adding a permanent extension to the platform on the east end. Contractor will build a temporary ramp to access the east end of the platform (the new permanent extension). This is “temporary” as in it will last the duration of the project. The final access ramp will be a new one on the west end of the platform. The temporary access ramp WILL be ADA accessible. We cut the temporary platform extension out of the project in favor of the permanent extension. 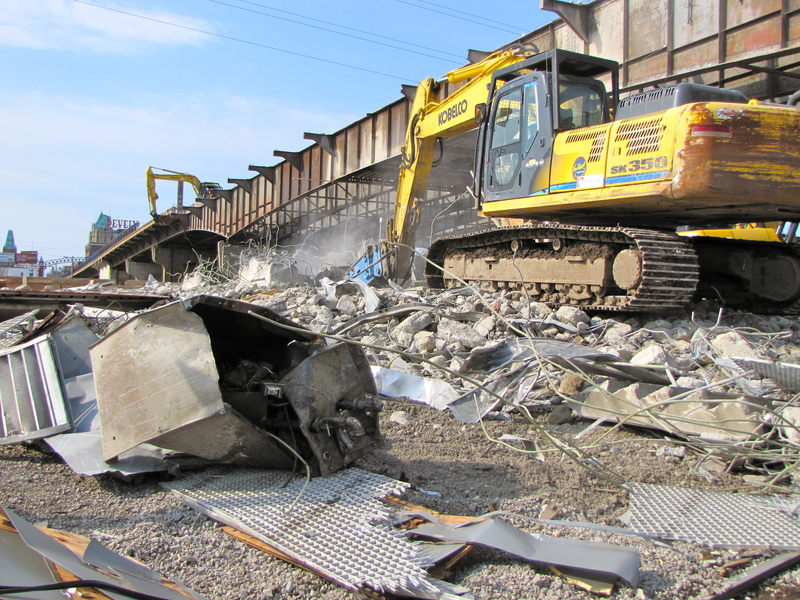 Saturday and Sunday, March 26-27, demolition will continue with disrupted MetroLink service and bus shuttling between Central West End and Civic Center MetroLink Stations. Thank you for such a thorough update. Keep them coming! Great pics btw! Do you have any video of the bride coming down? We will hopefully have video after this weekend, where the crew is scheduled to remove the large steel girders. Regarding the Grand Metrolink closure, often it has been written “Customers who normally use the Grand MetroLink Station will continue to board and deboard at the Union Station MetroLink Station to connect with the #70 Grand through April 3.” But not all Metro passengers who use the Grand Metrolink station need to connect to the #70 bus. I have been riding the #90 bus to the DeBaliviere station, then taking the train to the Grand Metrolink station going to and from work. Does the statement quoted above referring to April 3 mean that you expect the Grand Metrolink station to reopen at that time? So far, during the Grand bridge construction I’ve been driving to work, but I don’t want to continue to do that for much longer. The Grand MetroLink Station is expected to reopen around April 3, tentatively, and remain open throughout most of construction. The #70 Grand, #410X and #58X will go to the Grand Station, but reroute around the closed bridge.